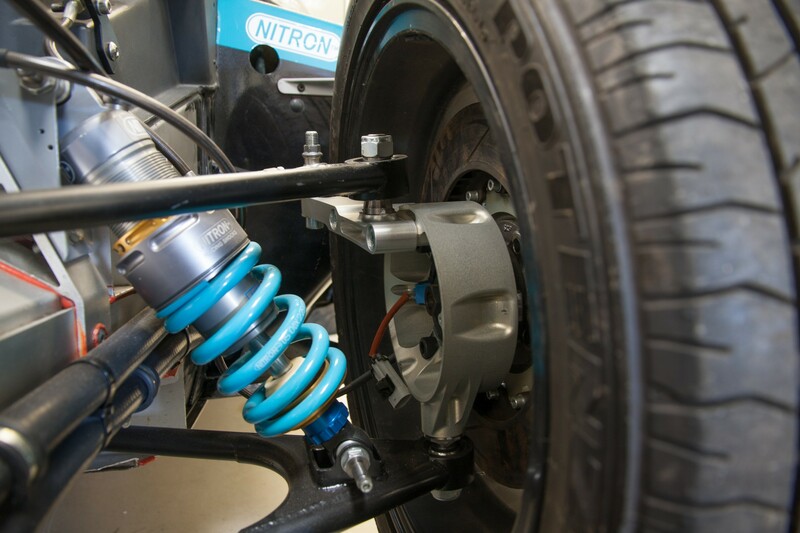 For almost 15 years Nitron have been building a reputation as one of the leading manufacturers of aftermarket suspension upgrades, particularly when it comes to Lotus cars. 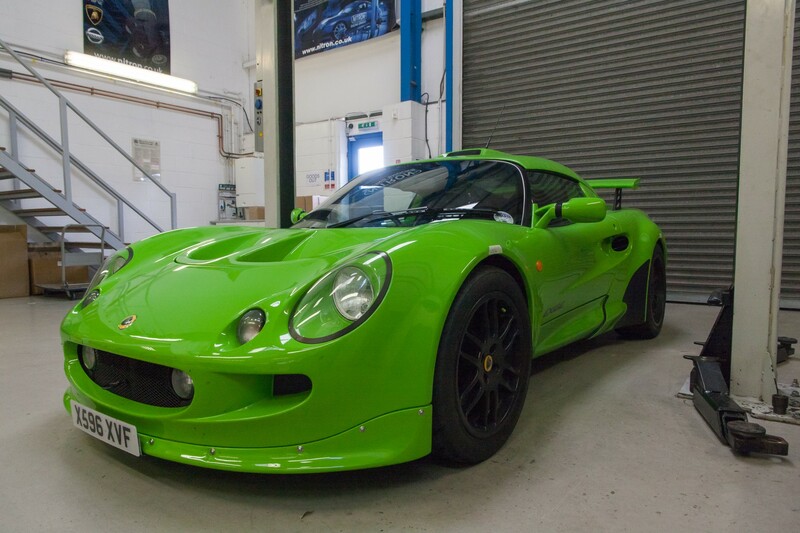 Last year we were able to take a look around the companies Witney based factory as part of the factory tour organised by Seriously Lotus and were very impressed by what we saw. With the company joining forces with SELOC for 2013 for the Nitron SELOC Speed Championship we took the opportunity to pay a return visit and talk with CEO Guy Evans and Sales and Marketing Manager Mark Tapscott about the companies developments over the past 18 months. The NTR range of dampers have been popular with Elise owners for many year, but Nitron haven’t been resting on their laurels, working hard to evolve and improve the range, including simplifying the ordering process and adding a selection of NTR40 and NTR46 based solutions for the Evora. The company will still work with customers who have specific requirements, but the introduction of a range of ‘out the box’ specifications from Fast Road to Race help people choose a set-up which suits them and ease the sales process. 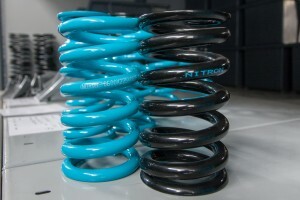 Nitron has also responded to criticism that their standard springs were somewhat prone to corrosion. 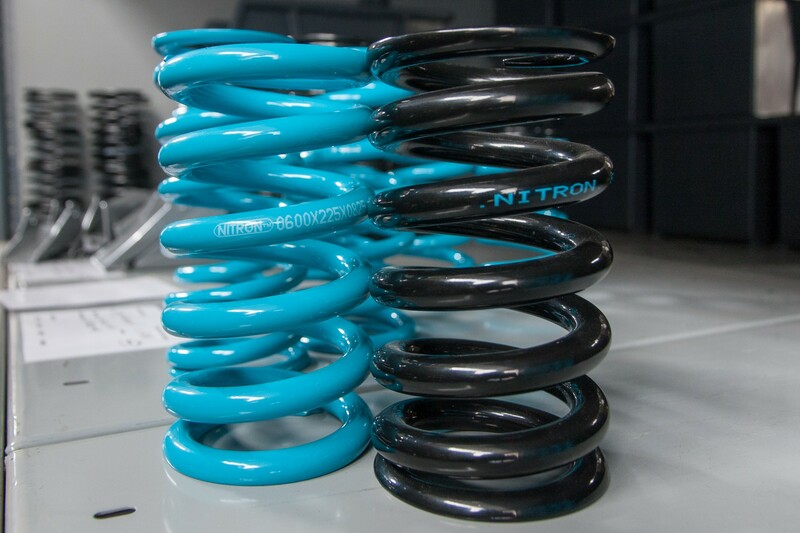 In the past Nitron offered optional Eibach springs for their NTR40 and NTR46 products, but supply chain issues meant the company has dropped the Eibach option and instead sourced a higher quality standard spring . Putting the old and new springs side by side the difference is clear to see. Despite this particular example being a stiffer spring (825lb/ft compared to 600lb/ft for the older spring) the higher quality steel allows for thinner coils, giving increased suspension travel before the coils meet. Another added bonus is that the new springs are also considerably lighter, not to mention look a bit more special now finished in Nitrons corporate colour of Turquoise. The improvements in the works extend beyond just revised springs, with work continuing on further refining the valving of the NTR46 dampers. To help with this Nitron are running an S1 Exige, previously owned by SELOC member 212 S/C and now owned by a friend of Guy Evans. Currently as near standard as you’ll find an S1 Exige – besides a lairy paint job and an Emerald ECU – and still sporting the original Koni sourced Lotus Sports Suspension. Driving it is a surprise, the LSS suspension giving a weird mix of an overly harsh ride over drain covers and potholes at low speed, yet along the tricky country lanes outside Witney it feels like it’s being held up by the front mudguards as opposed to the springs – scuffing them along the surface as it pulls left and right erratically over the bumps and robbing you of the confidence you need to carry any real speed down the road. It’s a stark reminder of just what impact the suspension and geo setup have on the way the cars handle and we look forward to having a chance to try the car again in future once the guys at the factory have worked their magic on it. 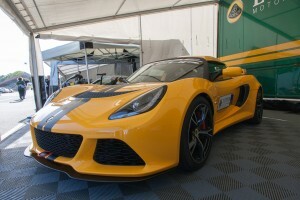 Speaking of Exiges, one of the more interesting projects at Nitron this year has been their work with Lotus Car and Lotus Racing to provide the standard dampers for the new Exige V6 Cup, as debuted at this years Lotus Festival. The project marks the first time Nitrons have appeared on a factory Lotus and the companies worked together to produce a solution which matched Lotus’s requirements. The final solution features 2-way adjustable dampers with a tuned range of bump and rebound adjustment to allow track day and race drivers to tune the cars handling without too much scope to hurt the overall balance. Interestingly the car uses a combination of 40mm front and 46mm rear dampers, owing to the increased mass at the rear of the car compared to previous generation Exiges. It’s safe to say that with Project N2, things escalated quickly. Now after almost 2 and a half years work the car is finally starting to take shape, and it’s almost unrecognisable. 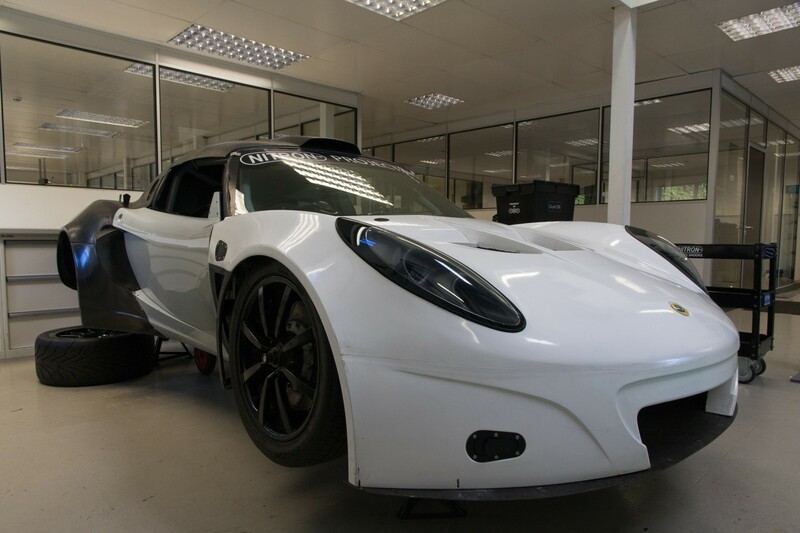 The car has been stripped back to the bare-bones and is being rebuilt as a 430bhp, fire-spitting Exige GT3, complete with modified bodywork based on the original wide-body Exige GT3 moulds. While the bodywork may still be a little rough in places at this stage the attention to detail underneath is staggering, with bespoke components through the car, especially in the suspension where machined aluminum is used extensively to reduce weight – particularly unsprung. The uprights in-particular are works of art, complete with redesigned hubs featuring centre-lock wheel nuts, giving the perfect platform for the NTR Race Pro 3-Way 46mm shocks to work with. There is still plenty work to be done however, with the team looking to create new front wishbones to lengthen the wheelbase and help centre the wheels in the front arches – a common Exige GT3 quirk – along with installing the MoTeC ECU, for the heavily modified 2ZZ-GE engine, and Geartronics GCU, to control the paddle shift for the Sader ST90 sequential gearbox, and getting them to work together. Once complete Nitron hope to take the car to the Nurburgring and other tracks for lap record attempts, and you can keep track of their progress on the Nitron Project N2 blog.